A pasta drying rack is exactly what its name indicates. It is a stand that has various extensions from which pasta can be hung to dry. The basic design of a pasta drying rack contains a stem with different rods to hang the pasta from. The device has a flat and sturdy base which prevents the rack from toppling over when the wet pasta, which can be considerably heavy, is hung on it. One of the elements of the design of the pasta drying rack is its symmetry. These racks have to be symmetrical so that the pasta can be hung from both of its ends. This helps balance the weight or else it can tip in one direction. Apart from this one point, there is no dearth of designs with pasta drying racks. Some of these designs can be very inventive making the whole rack a showpiece when it is not in use. What are the Different Styles of Pasta Racks? The styles of pasta racks are quite numerous, and in fact manufacturers keep introducing new styles all the time so as to keep up with the novelty value of these products. They can be made of various materials such as metals, plastics and wood. Sizes can be different, but they are not generally too big, just enough to hang a single layer of pasta dough, folded double. 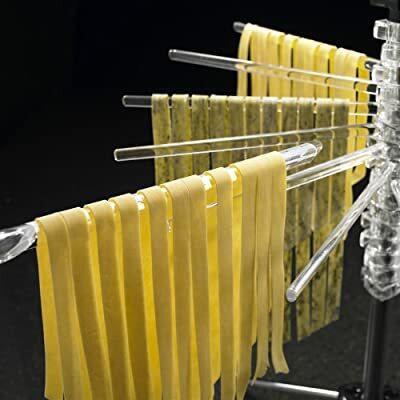 One particular aspect of the design of the pasta drying rack is that it allows the pasta to be spread out considerably so that it allows for the circulation of air between them. This is important, otherwise the pasta will not dry uniformly and some might remain moist when removed. This can lead to rotting and mold formation when they are stored. Nowadays, movable and adjustable pasta drying racks are also available where the various extensions can be moved continually to allow all the pasta to be dried in turn. These are usually made of metal so that they can withstand the repeated movement. There are pasta drying racks for drying pasta in different shapes. For example, for people who like fusilli, the pasta racks that have special arrangements so that the pasta gets the shape when it dries. These racks are significantly more expensive in comparison to the usual ones. When buying a pasta rack over the Internet, you have to look beyond the aesthetic beauty and the price of the rack. There are some important things to look for when buying your own pasta drying rack online. Firstly, you would need to see how far apart the extensions are placed. This is one crucial step to ensure the pasta drying rack is capable of producing the right output you are looking for, and whether they are movable. Check to ensure that they can make pasta in the shape you want. Also, pay attention to the material that they are made of before you invest in a pasta drying rack. We’ve highlighted the pictures of some great models above, and also specifically highlight models fromKitchenAid and Norpro; have a look! If you need a pasta drying rack, then KitchenAid offers one that you might be interested in. It is made of plastic as opposed to most of the wood racks that compete against it, making it much easier to clean. If you have ever used a wooden rack, then you know that there can be a problem with dough getting “caked” on it, and since it has that wooden texture, this dough can be hard to get off. If you buy a plastic model, however, this will not really be a problem. The plastic may or may not last as long as wood, depending on a lot of different things…but you can usually count on it lasting at least as long as wood, if not longer. The KitchenAid plastic model has plenty of arms to get the job done, however, if you make a LOT of pasta when you make it, you might require two pasta drying racks. I have a hard time believing that you would need more than one or two racks though, unless you were making pasta in a commercial environment. So, one or two should suffice nicely. If you are looking for a good pasta drying rack for your homemade pasta, then look no further than Norpro. They offer products that can help you make pasta and dry it, and the products are so simple and easy to use that you can be sure that nothing could go wrong! The toughest part about making pasta is finding a place to dry it. You cannot very well just leave it in a bowl or on the table….this will cause it to dry in a manner that is not good for it. 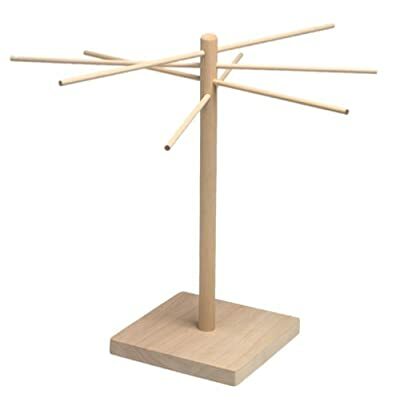 You need it to hang while it dries, which is where a pasta drying rack from Norpro comes in. Simply set up the rack where it will be out of the way, and hang the pasta off of any one of the eight dowel arms to dry it. Most of these pasta racks stand about a foot and a half high, so you won’t have to worry about your pasta dragging on the ground or being bent at the end as it dries either. They also feature a sturdy base so that it will not tip over as you heap the new pasta onto the arms. These Pasta drying rack above are 2 best on the market. Hope this article will help you pick the best one for your needs.